J U L Y - 4 T H - 2 0 0 3 ! I seem to remember a no-no against Beantown at YS on July 4th, 1983. Must've been revenge or something. Doesn't beat October 2003, though! A-Rod must've caught the Yankee bug: lousy hitting in April. He'll get around, since his fielding practice has taken precedence over his hitting. We need to put Bubba Crosby in CF for a few games, then see if he lights a fire. Like every other year, the Beantowners continue to enjoy their April WS. Just think, the May WS is just around the corner. 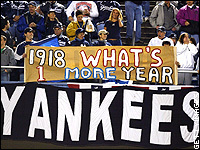 Hope the "Yankees S*ck" parade doesn't last too long. After all, in June or July, it'll be over. In September, it'll definitely be all over for you folks! Enjoy the cheers in your Sam Adams. In a few months, you'll be crying in it, and have plenty of company! Two down, two to go . . .
* Anyone see Matt around? I'm not working on Saturdays anymore. I took a rare opportunity to go outside, have some fun. Unfortunately, the game was on, so less fun than expected. We can still get the split. If not, then even TB, Brewers and Togers ruled in April also. In June, we declare war! Isn't there a bed in Ken's house? Lullaby, Ken, and good night. If he gets his no-no at Fenway, which he'd just missed in Sept '01, I'll be a happy camper! Now git to sleep, dude. Either that or just git! You can keep ARod; but you really ought to teach him that wooden thing is a "bat", and the first thing is to hit the "ball". Hmm, maybe you ought to teach a few others, too. Sitting in the grandstands, watching Schilling's ERA go down,down, down. Bostonians (not Beantowners, that is rude), do not, ever, cry in alcohol of any kind; we are a frugal lot. Which is why Pedro, Nixon, & Nomah are getting plenty of rest for October. So Bellhorn can practice hypnosis, and continue to lead the league in walks. Sunday paper, (rustle, rustle), oh dear, Matt, Celtics, Bruins, some team called the Patriots... ah, here we are... well, .455, not bad. Batting leaders=0, wait, Soriano's on THAT list. Conteras ERA=8.44, Lowe=3.00. 2003 vs Sox, Conteras ERA=15.00. Matt, dear, would you like a crying towel? Alex, of all people, is somehow in a slump. He's switched positions and he's on a very competitive team. He just left 3 seasons of the cellar of the highly competitive AL West. Now he's in the heat of the battle he's not accustomed to. Lots of people haven't really awoken yet, so my namesake has his work cut out for him as hit coach. I've heard the word "Beantown" the past 20+ years from the NY Daily News, so ... Boston does make baked beans, don't they? OK, I'll instead call you folks chowdaheads. Feel better? Contreras is in his soph year after coming here w/o a 4-seamer, so he'd never had any competitive moments. I figure he'll have a bad 1st or 2nd inning, then he'll be OK. He'd pitched well against the White Sox, who were in the AL Central title race last September. He'll improve, but I won't say today's game will be an indication of this. I doubt he'll keep his 15.00 ERA vs Bahhston, if that's what it is. Lowe is good, I've liked his pitching. If Henry, Lucchino et al can't afford him, get used to him being in a new (and improved) uni next season. He may even be "properly attired"
Oh, Sori's on that list? Doesn't surprise me. How's his fielding? No crying towel necessary. You can lend me one, but I'll mark it "Return to Sender" this October, if not September. Isn't that very nice of me? So Pedro, Trot and Nomah won't be available 'til October? Oh well, nice to know they won't be needed. Guess I can't blame yesterday on that damned 'Scooter'? Oh and Ken, can you remind me of what happened in the last two games of that July 4th series last year? I seem to remember leaving with some Pride after those games. Last edited by BC498; 04-18-2004, 08:22 AM. Ken's digging for straws by referring to this July 4th, 2003 game at Fenway, which we lost 10-3 (Lowe v Boomer). We won 10-9 (in games) that season, so it doesn't matter. Last edited by Mattingly; 04-18-2004, 10:44 AM. Yanks are finally having fun and Lowe is feeling mighty ... well, low! Now then, where's Ken? Probably in "Splittsville", if we can win these two games. 6-1 so far? I take back everything I said about Derek Lowe. We've already got one Derek on our team and he's way cool! Mark Malaska relieved Derek Lowe. 6 ER in 2.2 IP. P-U. Top of the 3rd, and Ken is seeing lots of RED! Nice bat-around in letting Alex finish what he'd started. Tell Wally I say "Thanks!" -J Giambi singled to left, A Rodriguez to third. -G Sheffield doubled to left, A Rodriguez scored, J Giambi to third. -H Matsui singled to left, J Giambi scored, G Sheffield to third. -J Posada doubled to left, G Sheffield scored, H Matsui to third. -T Lee struck out swinging. -E Wilson singled to right, H Matsui scored, J Posada to third. -D Jeter grounded out to shortstop, J Posada scored, E Wilson to second. -B Williams doubled to shallow left, E Wilson scored. -M Malaska relieved D Lowe. -A Rodriguez flied out to center. In a game like this, I'm just gonna rattle Ken's cage, win or lose. Hopefully, win. At least Torre knew when to take Contreras out. Hellooooooooooooooooooooooo, Terry Francona! Ohhhh Kennnnnnnnnnnnnn! I guess good pitching beats good hitting? -M Rivera relieved T Gordon. -C Crespo grounded out to third. -G Kapler hit for P Reese. -G Kapler singled to right. -J Damon flied out to right. -G Kapler to second on fielder's indifference. -B Mueller grounded out to shortstop. Last edited by Mattingly; 04-18-2004, 02:41 PM.